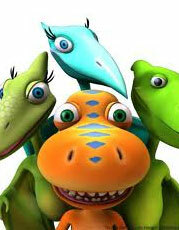 Preschoolers get to hop on board the "Dinosaur Train" to learn about natural science, natural history and paleontology. Each half-hour episode of this series, produced in CGI-animated format by the Jim Henson Company, features Buddy, a preschool-aged Tyrannosaurus Rex, and his adoptive Pteranodon family traveling on a special train to meet all kinds of dinosaurs and explore the world inhabited by these amazing creatures. Also included are live-action segments hosted by paleontologist Scott Sampson. Laura the Giganotosaurus; Dinosaur Poop!